By now I feel like I've shared this sweater so much (here and here for example) that it's only appropriate to dedicate a post to it. These photos are probably my favorites I've taken this semester, so I couldn't go without sharing them! I also felt this outfit is a fitting Thanksgiving outfit idea, especially relevant given yesterday's post. I didn't used to like the color red at all, but since transferring to UW where the colors are red and white, I pick up pieces in red whenever I can, and this sweater is by far my favorite red-colored piece I own. Not only is the color of this sweater fun and festive, but it is so cozy. It's super big and thick, it feels like you're wrapped in a blanket! 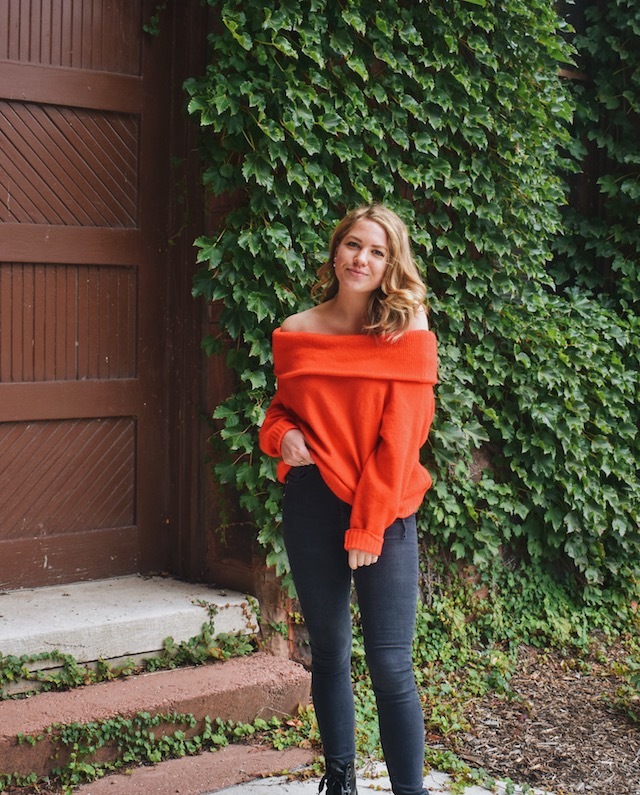 I thought the off-shoulder trend was over and done with, but I have to admit this silhouette is so flattering, it's one of the most confidence-boosting tops in my closet. Unfortunately this exact sweater is sold out online, but this is the same one in a more everyday neutral color, and this red one is very similar! Of course I paired it with my new favorite shoes, the patent Dr. Marten's with the platforms and silk bows... still so obsessed. What's your favorite sweater this fall?